RapidFixer is the PUP that uses misleading techniques to prevent removal. Use Reimage to locate malicious components and get rid of them faster than with uninstall instructions. A full system scan blocks virus reappearance and prevents traffic to malicious domains. 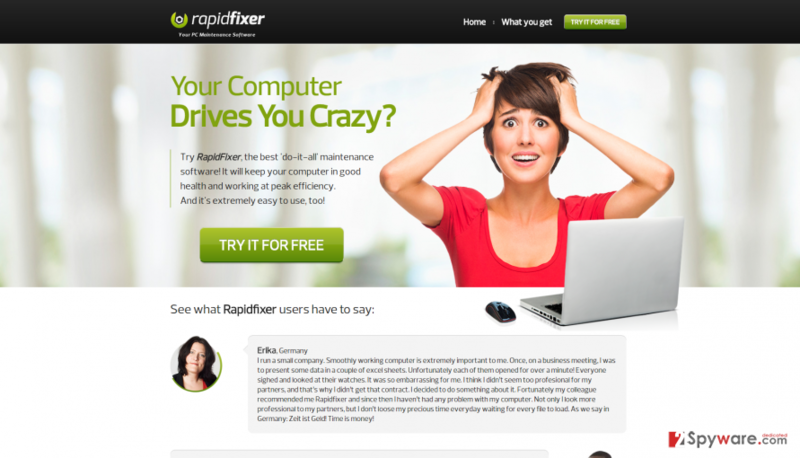 How does RapidFixer work and what is the aim of it? How could RapidFixer enter my system without my knowledge about it? How can I eliminate this PC intruder? RapidFixer is a potentially unwanted program (PUP) which causes negative effects to your computer. This program claims to be a reliable computer security tool, which will ”keep your computer in good health and working at peak efficiency”, but the aim of this program is to swindle money from its users by frightening them and informing them about unreal problems. If you want to find out how exactly this program works, proceed to the next paragraph. RapidFixer is classified as a system tool. In most cases, it slithers into PC users’ systems without their consent. After this potentially unwanted program infiltrates your system, you will experience various unpleasant situations. This system tool will block access to reliable and safe websites, you will receive unrealistic warning messages and alerts that will inform you about fake infections and other dangers to your computer. Your computer will slow down, and you will be annoyed to death by RapidFixer activities, as it will for sure interrupt your work or just browsing experience. RapidFixer aims to scare you that your computer was infected with some computer threats, and it will obstruct legitimate websites and will not allow you to install professional security programs. The aim of this program is to make you panic and force you to download the full version of RapidFixer scanner. Apparently, you do understand that this program is deceptive. To avoid such situations and to ensure your PC safety in advance, you should install a trustworthy anti-malware program, for example, Reimage – it will detect and remove potential computer threats. 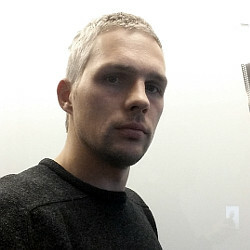 RapidFixer can be either downloaded from its official website, but more frequently this intrusive application reaches users’ systems without their straightforward permission. This method is called bundling. The developers of such programs usually pack their products together with other legitimate program and spread the download links on the web. 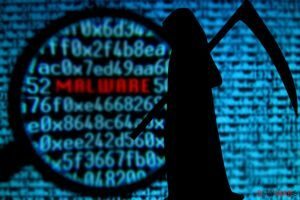 So if you download a freeware or shareware from a suspicious website, it does not matter that the program is a well-known and reliable-looking application. There’s a major possibility that you may receive a bundled software pack. Also, you should know that ”default” or ”standard” installation option is NOT a safe choice. They usually conceal the agreements to install optional applications. So instead of choosing this option, opt for ”advanced” or ”custom” mode – it allows to configurate which software components you do want to install and which ones you do not. 1. Click ‘Start’ and select ‘Control Panel. 2. Click ‘Uninstall a Program’ under ‘Programs’. 3. Choose ‘RapidFixer’ and select the ‘Uninstall/Change’ option. 4. Click ‘Yes’ and ‘OK’ to save the changes. This entry was posted on 2015-10-15 at 03:17 and is filed under System tools, Viruses. You can quickly scan the QR code with your mobile device and have RapidFixer manual removal instructions right in your pocket. How did you remove RapidFixer?